If you’re like us, then you’ll enjoy hitching your caravan up in summer and exploring the great outdoors. Picture this: you’re cruising along in the sun, taking in your surroundings or setting up your camp and preparing to take a load off in the cool air and all of a sudden, your air conditioner decides to break. When you’ve decided to take a well-earned break and start relaxing, there’s nothing worse than being stuck with broken caravan air conditioning. That’s where we come in. Before you call a standard air conditioning repair service, think twice. At Towfix, we offer a comprehensive range of caravan repair services, so you can now rest assured that when you’re stuck in the heat on your next big adventure our expert team will be sure to look after you. If you can tow it, then we can repair it. 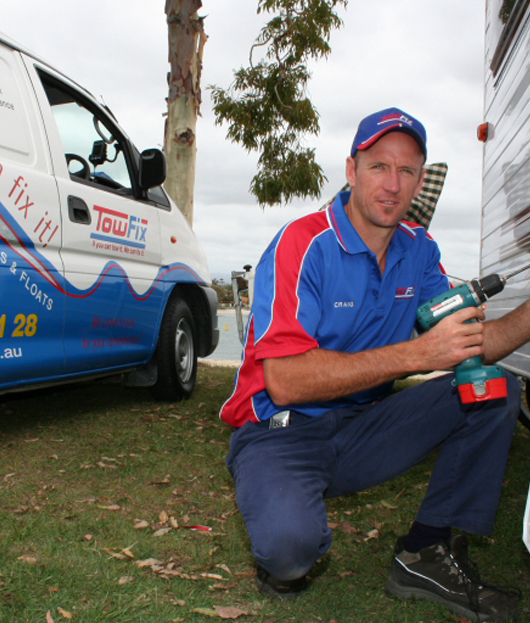 At Tow Fix, we’re proud to be one of the leading caravan, trailer and horse float repair service in Australia. Our highly-trained experts offer a comprehensive range of services to ensure your caravan is in perfect working order. Whether you need your caravan awning to be repaired or your caravan fridge looked at, you’re in capable hands with the Towfix team. Whatever your issue may be, simply give us a call and we’ll be happy to offer an appraisal and use the best parts available. What’s more is that no matter where you are in Australia, our service can come to you. At Towfix, we offer a full range of repairs and services to ensure your caravan, trailer or horse float is in working order, both inside and out. So, if your caravan air conditioning unit needs a service or repair, wherever you are in Australia, please don’t hesitate to get in touch to arrange a consultation. Find your local Towfix specialist today.